Mirror photo by Gary M. Baranec Bellwood starters Riley D’Angelo, Tina Hollen, Alli Campbell and Emilie Leidig hoist the PIAA Class 2A championship trophy on Monday in Hershey. 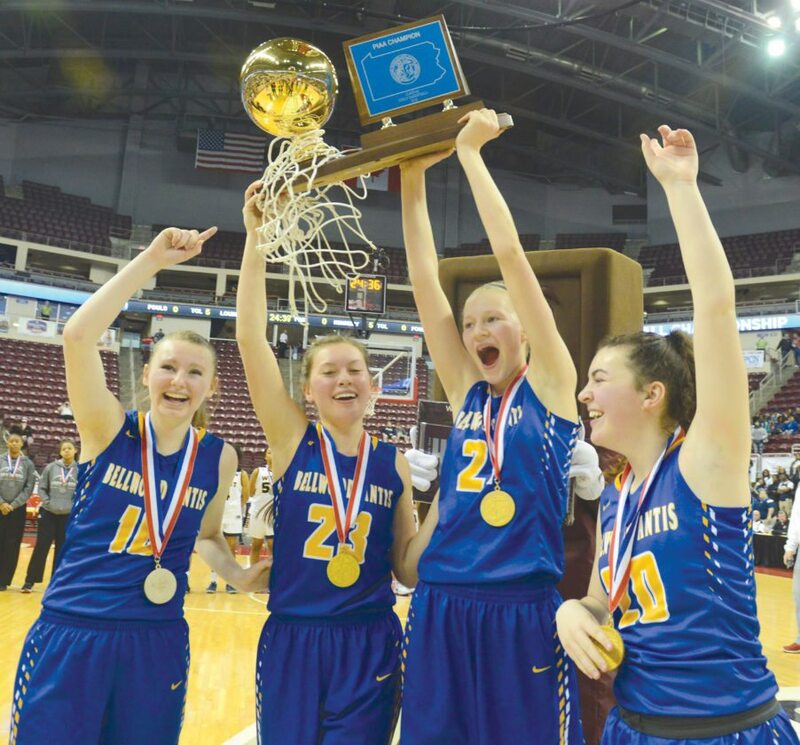 HERSHEY — Bellwood-Antis’ starting five displayed no signs of fatigue as they hugged family members, took turns hoisting the PIAA Class 2A championship trophy and screamed at the top of their lungs. Perhaps it was the adrenaline from the school’s first girls basketball state title, but more likely, it was the result of an incredible work ethic that made the Lady Blue Devils into champions. Campbell scored a game-high 34 points and led Bellwood-Antis to a 45-42 victory over District 12 champion West Catholic in the 2A final Monday at Hershey’s Giant Center. Campbell’s 3-pointer on a pass from Riley D’Angelo with 2:19 to play gave B-A a 40-39 lead that the Lady Blue Devils never relinquished. Campbell, D’Angelo, Sakeria Haralson, Tina Hollen and Emilie Leidig played all 32 minutes for Bellwood. Swaney has credited the Lady Blue Devils’ offseason workout program as building up their stamina for situations like Monday. Bellwood-Antis led by as many as nine early in the second quarter, but West Catholic closed within three by going on a 10-4 run over the last 6:44 of the half. The teams traded the lead back and forth in the third quarter before Campbell made a 3-pointer to make it 34-32 B-A in the final minute. Destiney McPhaul’s layup with 3:15 to play gave West Catholic its final lead. McPhaul, who along with Tamiah Robinson led the Lady Burrs with 12 points each, scored the basket off an offensive rebound. Haralson had her hands on the ball from behind McPhaul’s back but relented, because she had four fouls. Haralson lost that battle, but her restraint kept her on the floor. After Campbell gave Bellwood-Antis the lead, Haralson altered Kyliah Singletary’s layup and came down with the defensive rebound. Campbell made two free throws seconds later to extend the lead to three with less than two minutes to play. Haralson finished with just four points but had a game-high 14 rebounds. The Lady Blue Devils overcame 16 turnovers by getting back on defense and contesting fast-break opportunities. Down by three, West Catholic’s lone senior Jaelyn Durrett missed a 3-pointer, and McPhaul missed one of her own after an offensive rebound in the final minute. West Catholic got one more chance when Campbell missed the front end of a one-and-one from the foul line, but McPhaul missed a layup with 30 seconds left and Hollen pulled in the rebound. WEST CATHOLIC (42): Robinson 5 0-0 12, McIntyre 1 0-0 3, Hosendorf 1 0-0 2, Durrett 1 0-0 2, Singletary 3 1-2 7, McPhaul 5 1-3 12, Edney 2 0-0 4, Montgomery 0 0-0 0. Totals — 18 2-5 42. Officials: Bridget Borelli, Keith Genicola, George W. Malanosky.